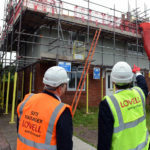 Homes regeneration specialist Lovell has been appointed by Sandwell Council to help deliver a new multimillion-pound external works programme for council homes across the West Midlands borough. Work is starting this month (February) on the council’s £40m external upgrading scheme for its housing stock. The four-year external works programme will see roofs, windows (where single-glazed or externally beaded double-glazed) and wooden front and rear doors replaced as well as the renewal of render and exterior paintwork and environmental improvements such as new fencing and landscaping. Existing insulation will also be reviewed and improved to make homes warmer and minimise fuel bills for residents. Lovell Regional Refurbishment Director Carl Yale commented: “Having worked closely with the council and the local community to modernise and improve local council homes since 2005, we’re delighted to be continuing that relationship through this important new contract which will focus on external envelope improvements. The programme will help tackle fuel poverty, and deliver homes, which are warmer and more secure for residents.